LAS VEGAS -- A stamp that mistakenly featured the image of a Statue of Liberty replica in Las Vegas instead of the original New York Statue will cost the U.S. Postal Service $3.5 million in a copyright infringement lawsuit. 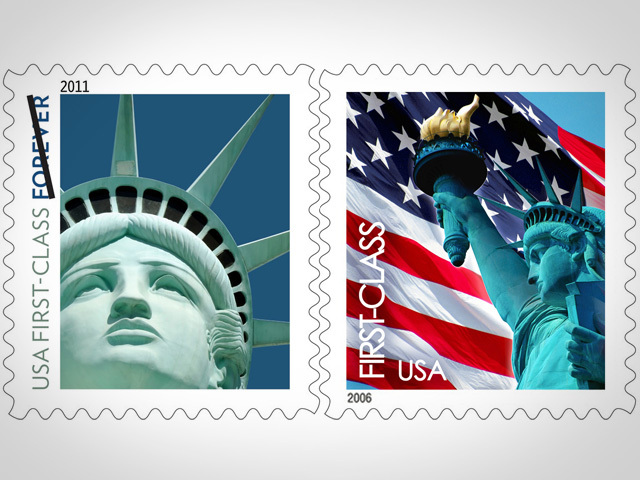 Las Vegas sculptor Robert Davidson, who created the replica Lady Liberty in the facade at the New York-New York casino-resort on the Las Vegas Strip, sued the Postal Service five years ago over its 2011 "forever" stamp design. The stamp featured the face of his Lady Liberty, which his attorneys argued in court filings was unmistakably different from the original and was more "fresh-faced," ''sultry" and even "sexier." "I just thought that this needed a little more modern, a little more contemporary face, definitely more feminine," Davidson said, according to court documents.